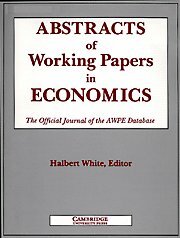 AWPE is the best point of access for thousands of working papers in all areas of economics, finance and econometrics. From its network of over 70 research centres worldwide, AWPE provides full bibliographic information including working paper series addresses, web links, price and availability, plus JEL classification codes and complete abstracts for these very current and often hard-to-get working papers. Each issue includes about 550 of the latest papers, all indexed by author, issuing institution, and enhanced by a keyword index and a permuted title index.